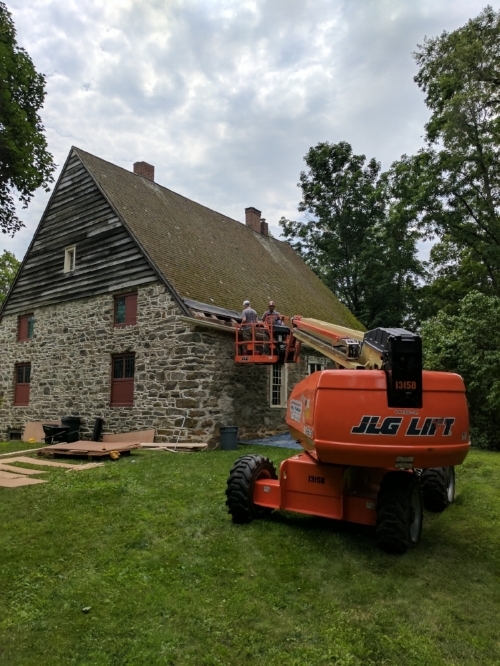 NEW PALTZ, NY (June 1, 2018) – Starting June 4, phase one of the project to restore the original 18th-century roof framing of the Jean Hasbrouck House (ca. 1721) at Historic Huguenot Street (HHS) will begin and is expected to continue through June 15. 1. Timber frame assessment at the Jean Hasbrouck House in July 2017, Historic Huguenot Street, New Paltz, NY. Photo by Ken Follett. Provided by Historic Huguenot Street. 3. Timber framers Ian Stewart, Rudy Christian, Laura Saeger, Windy McGlinsky and intern in front of the Jean Hasbrouck House at Historic Huguenot Street, New Paltz, NY. Photo by Renzo Cinti. Provided by Historic Huguenot Street.